Sugar Pie is made from a fuzzy pink material covered in pink hearts with a white belly and muzzle. 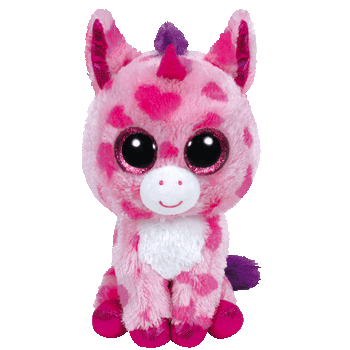 She has large, sparkly pink and black button eyes and pink stitching for her nostrils. The inside of her ears and her hooves are made from glittery pink material and she has a furry purple mane and tail. On her forehead, is a small bright pink horn. I’d love to be friends, with you I’ll be ture! Sugar Pie was released on 1st July 2015. Her Birthday is on 3rd March. This is the small 6″ version of Sugar Pie. She was also released in a medium 9″ size. Sugar Pie is a Valentine’s Day themed Beanie Boo. The word “ture” instead of “true” in the poem was an actual error in the swing tag.